]Just because you don't see anything unusual in your mouth doesn't mean that you shouldn't be concerned about oral cancer. Some people are under the impression that they shouldn't need to get checked until they notice a problem, but this simply isn't true. The likelihood that oral cancer can be treated will increase if it is found early, so it is crucial to have periodic screenings to look for signs of a problem. 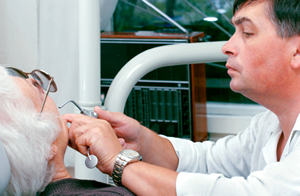 According to the American Cancer Society, the best way to determine if you living with oral cancer is to have periodic screenings with your dentist. These can be completed at your six-month appointment and cleaning, and your dentist will look for signs of cancerous growths. These screenings involve inspecting the tongue and mouth for small sores and red or white patches. If you are at an increased risk for developing oral cancer, it is even more important that you get regular screenings to look for the sign of a problem. While self-exams with a mirror can help you to look for changes in your oral tissues, you still need to follow-up with your dentist every six months for a professional evaluation.